Our studies suggest that the spiral wave chimeras, core expansion and core splitting observed in the BZ system are likely to be found in a range of other systems with the common properties of immediate firing following a perturbation and long-range interactions. 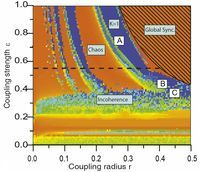 For example, we have found similar spiral wave chimera behaviour, with core splitting and the transition to predominantly asynchronous behaviour, in populations of nonlocally coupled FitzHugh–Nagumo oscillators. The PRC for the FitzHugh–Nagumo system resembles the PRC of the BZ system and ZBKE model, with an immediate firing region. 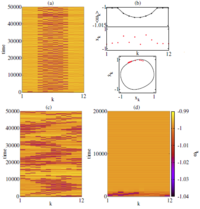 Pulse coupled oscillator models of neuronal systems can also have immediate firing dynamics, suggesting that certain neuronal networks might exhibit spiral wave chimera behaviour similar to that described here. 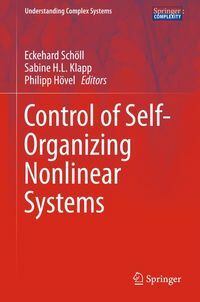 Other possible systems where these behaviours might be found include biological tissues and arrays of physical oscillators. 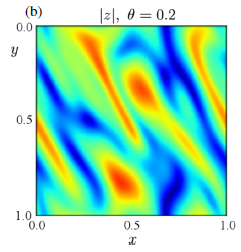 We study the dynamics of an array of nearest-neighbor coupled spatially distributed systems each generating a periodic sequence of short pulses. We demonstrate that, unlike a solitary system generating a train of equidistant pulses, an array of such systems can produce a sequence of clusters of closely packed pulses, with the distance between individual pulses depending on the coupling phase. This regime associated with the formation of locally coupled pulse trains bounded due to a balance of attraction and repulsion between them is different from the pulse bound states reported earlier in different laser, plasma, chemical, and biological systems. 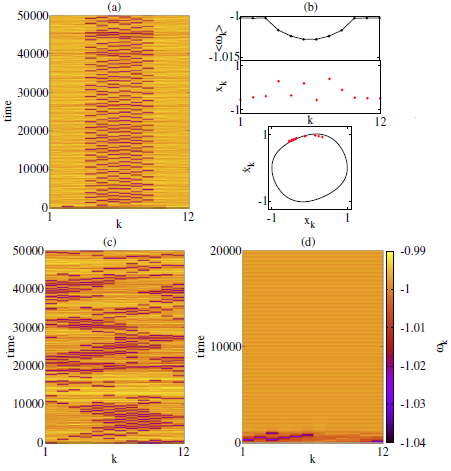 We propose a simplified analytical description of the observed phenomenon, which is in good agreement with the results of direct numerical simulations of a model system describing an array of coupled mode-locked lasers. The two-photon dressing of a “three-level ladder” system, here the ground state, the exciton, and the biexciton of a semiconductor quantum dot, leads to new eigenstates and allows one to manipulate the time ordering of the paired photons without unitary postprocessing. We show that, after spectral postselection of the single dressed states, the time ordering of the cascaded photons can be removed or conserved. Our joint experimental and theoretical study demonstrates the high potential of a “ladder” system to be a versatile source of orthogonally polarized, bunched or antibunched pairs of photons. We demonstrate that chimera behavior can be observed in nonlocally coupled networks of excitable systems in the presence of noise. 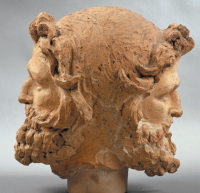 This phenomenon is distinct from classical chimeras, which occur in deterministic oscillatory systems, and it combines temporal features of coherence resonance, i.e., the constructive role of noise, and spatial properties of chimera states, i.e., the coexistence of spatially coherent and incoherent domains in a network of identical elements. Coherence-resonance chimeras are associated with alternating switching of the location of coherent and incoherent domains, which might be relevant in neuronal networks. 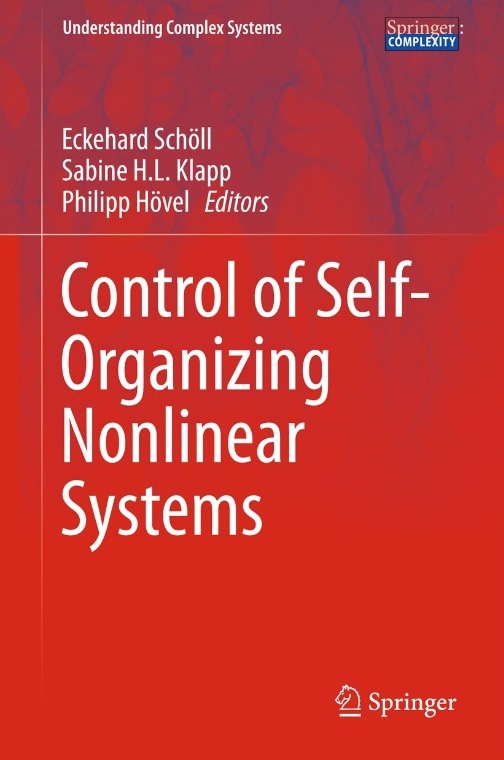 Feedback control of quantum mechanical systems is rapidly attracting attention not only due to fundamental questions about quantum measurements but also because of its novel applications in many fields in physics. Quantum control has been studied intensively in quantum optics but progress has recently been made in the control of solid-state qubits as well. In quantum transport only a few active band passive feedback experiments have been realized on the level of single electrons, although theoretical proposals exist. 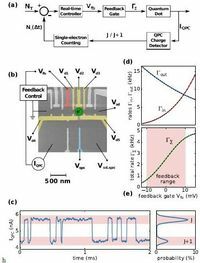 Here we demonstrate the suppression of shot noise in a single-electron transistor using an exclusively electronic closed-loop feedback to monitor and adjust the counting statistics. With increasing feedback response we observe a stronger suppression and faster freezing of charge current fluctuations. Our technique is analogous to the generation of squeezed light with in-loop photodetection as used in quantum optics. Sub-Poisson single-electron sources will pave the way for high-precision measurements in quantum transport similar to optical or optomechanical equivalents. 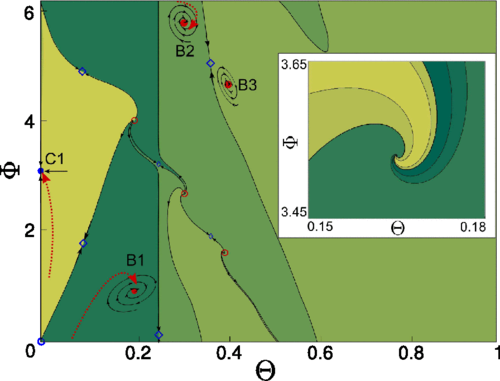 Dynamical systems with complex delayed interactions arise commonly when propagation times are significant, yielding complicated oscillatory instabilities. In this Letter, we introduce a class of systems with multiple, hierarchically long time delays, and using a suitable space-time representation we uncover features otherwise hidden in their temporal dynamics. 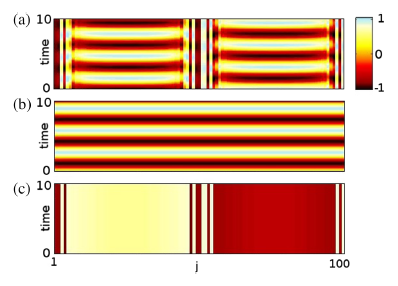 The behavior in the case of two delays is shown to “encode” two-dimensional spiral defects and defects turbulence. A multiple scale analysis sets the equivalence to a complex Ginzburg-Landau equation, and a novel criterium for the attainment of the longdelay regime is introduced. We also demonstrate this phenomenon for a semiconductor laser with two delayed optical feedbacks. 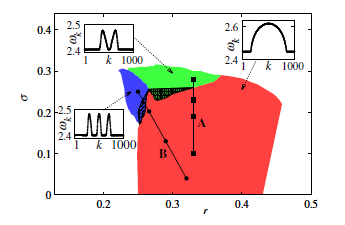 We investigate precursors of critical behavior in the quasienergy spectrum due to the dynamical instability in the kicked top. 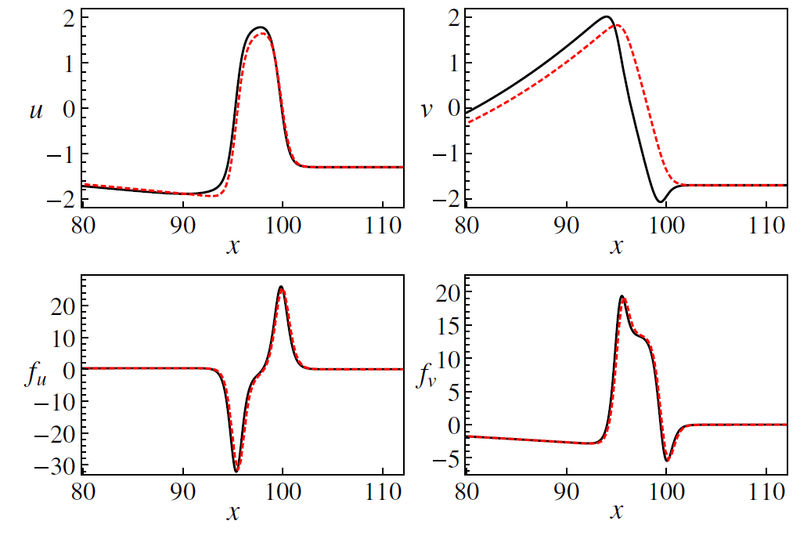 Using a semiclassical approach, we analytically obtain a logarithmic divergence in the density of states, which is analogous to a continuous excited state quantum phase transition in undriven systems. We propose a protocol to observe the cusp behavior of the magnetization close to the critical quasienergy. 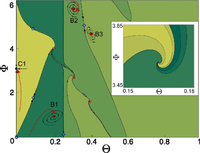 We present a method to control the position as a function of time of one-dimensional traveling wave solutions to reaction-diffusion systems according to a prespecified protocol of motion. Given this protocol, the control function is found as the solution of a perturbatively derived integral equation. Two cases are considered. First, we derive an analytical expression for the space (x) and time (t) dependent control function f(x,t) that is valid for arbitrary protocols and many reaction-diffusion systems. These results are close to numerically computed optimal controls. Second, for stationary control of traveling waves in one-component systems, the integral equation reduces to a Fredholm integral equation of the first kind. In both cases, the control can be expressed in terms of the uncontrolled wave profile and its propagation velocity, rendering detailed knowledge of the reaction kinetics unnecessary. Arrhythmias in cardiac tissue are related to irregular electrical wave propagation in the heart. Cardiac tissue is formed by a discrete cell network, which is often heterogeneous. A localized region with a fraction of nonconducting links surrounded by homogeneous conducting tissue can become a source of reentry and ectopic beats. Extensive simulations in a discrete model of cardiac tissue show that a wave crossing a heterogeneous region of cardiac tissue can disintegrate into irregular patterns, provided the fraction of nonconducting links is close to the percolation threshold of the cell network. 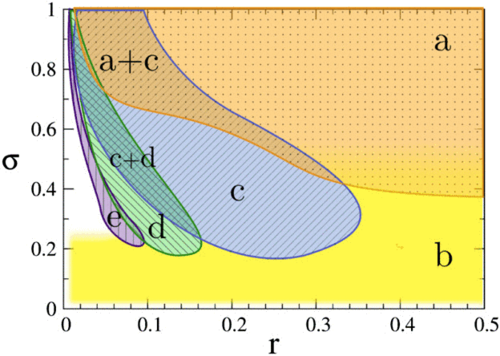 The dependence of the reentry probability on this fraction, the system size, and the degree of excitability can be inferred from the size distribution of nonconducting clusters near the percolation threshold. 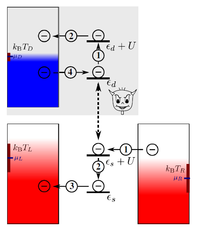 We present a physical implementation of a Maxwell demon which consists of a conventional single electron transistor (SET) capacitively coupled to another quantum dot detecting its state. Altogether, the system is described by stochastic thermodynamics. 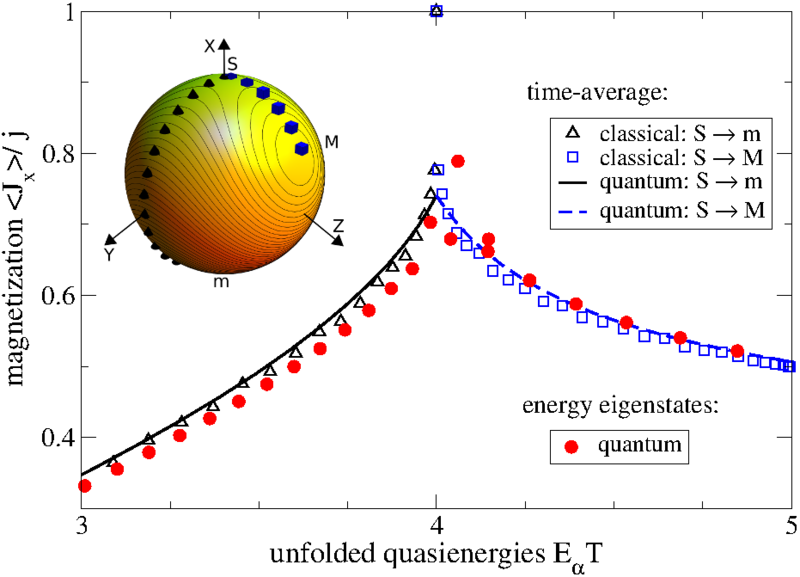 We identify the regime where the energetics of the SET is not affected by the detection, but where its coarse-grained entropy production is shown to contain a new contribution compared to the isolated SET. 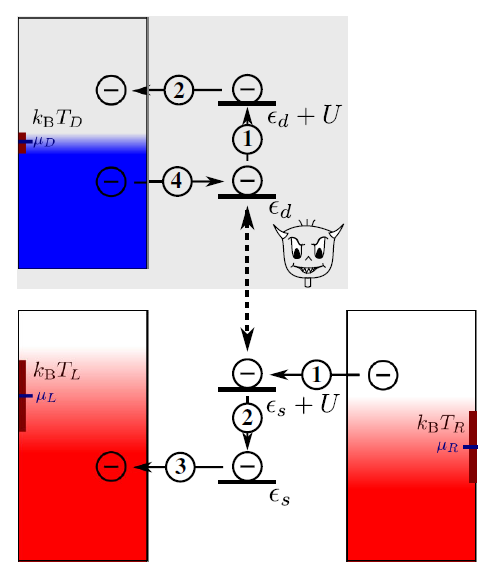 This additional contribution can be identified as the information flow generated by the “Maxwell demon” feedback in an idealized limit. Extrinsic and intrinsic control of non-classical photon states is of great importance in quantum information science. We investigate theoretically a single-emitter cavity system which operates initially in the weak-coupling limit. 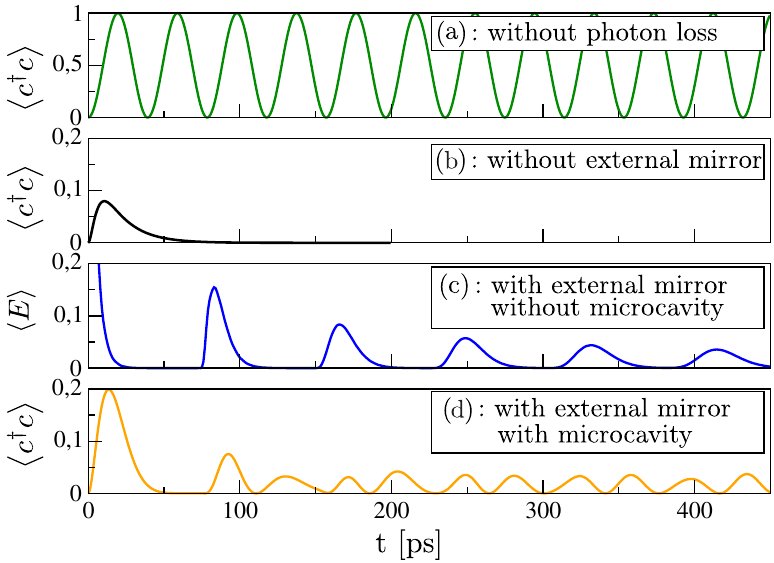 By applying an intrinsic control scheme, in particular quantum optical time-delayed self-feedback in the single-photon limit, we observe how this system is driven into the strong-coupling regime. This peculiar transition manifests in Rabi oscillations, observable in the coupled cavity field dynamics. This quantum optical apporach to time-delayed self-feedback opens new ways to experimentially controll features of cavity quantum electrodynamics in the single-photon limit. Magnetic particles have been made that undergo synchronized oscillations when suspended in liquid in a rotating magnetic field. This discovery links the fields of nonlinear dynamics and materials science. 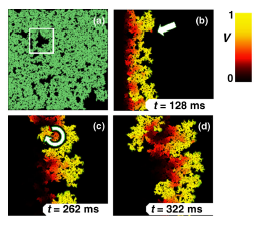 We show that an arbitrary periodic 2-dimensional spiking-patterns can be generated in a 2-dimensional lattice of unidirectionally delay-coupled neurons with appropriately tuned time-delayed couplings. The video shows an example: by appropriately choosing coupling delays, voltages in the array of 14x13 Hodgkin-Huxley neurons approach a stable attractor in the form of "SFB910" logo. 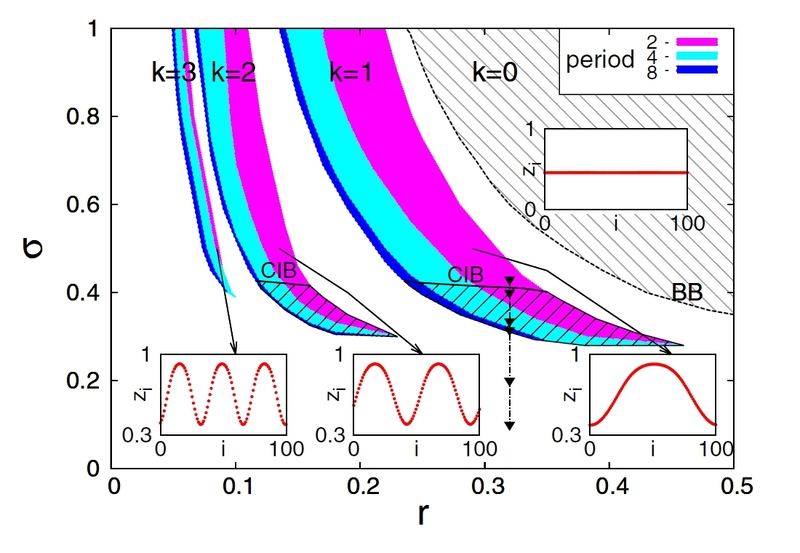 A systematic experimental study of pulse-coupled chemical oscillators with delay has confirmed a surprisingly large number of theoretical and mathematical predictions (see the dynamics for a pair of pulse-coupled oscillators; AP=antiphase (AP) and IP=in-phase oscillations, C=complex bursting dynamics, and OS=oscillator suppression). These results have implications for neuroscience and other biological fields. Synchronization of neuronal spiking in the brain is related to cognitive functions, such as perception, attention, and memory. It is therefore important to determine which properties of neurons influence their collective behavior in a network and to understand how. A prominent feature of many types of neurons is spike frequency adaptation, shown by a decrease in spike rate during prolonged stimulation. This behavior is typically mediated by slow transmembrane potassium currents that can be controlled by the brains neuromodulatory systems. 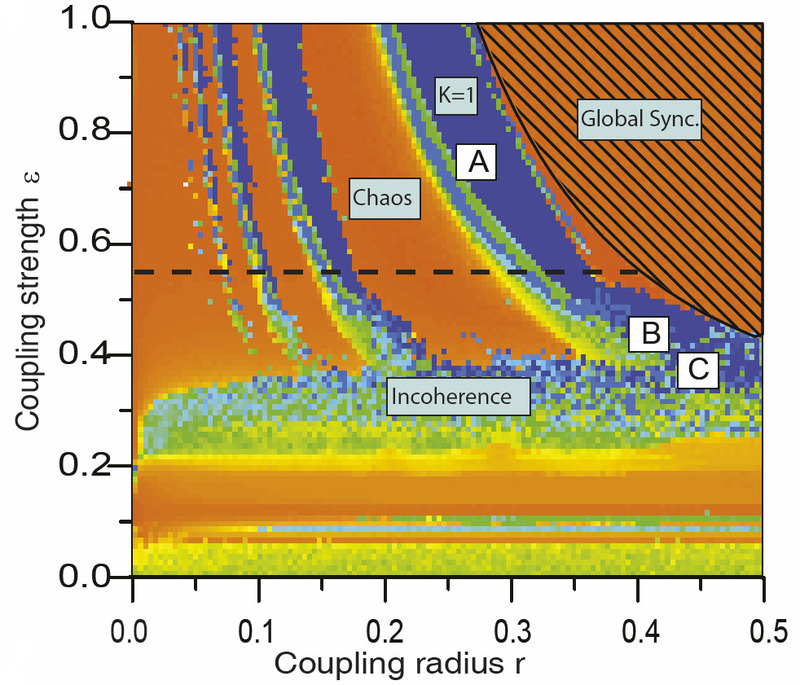 We investigated how these adaptation currents affect the synchronization tendency of synaptically coupled model neurons by applying phase reduction based on phase response curves (PRC). Therefore, we extended the adjoint method for calculating PRCs to dynamical systems with discontinuities. Using the experimentally verified and computationally efficient adaptive exponential integrate-and-fire model as well as a biophysically detailed neuron model for validation, we analyzed synchrony and phase locking of pairs and larger networks. 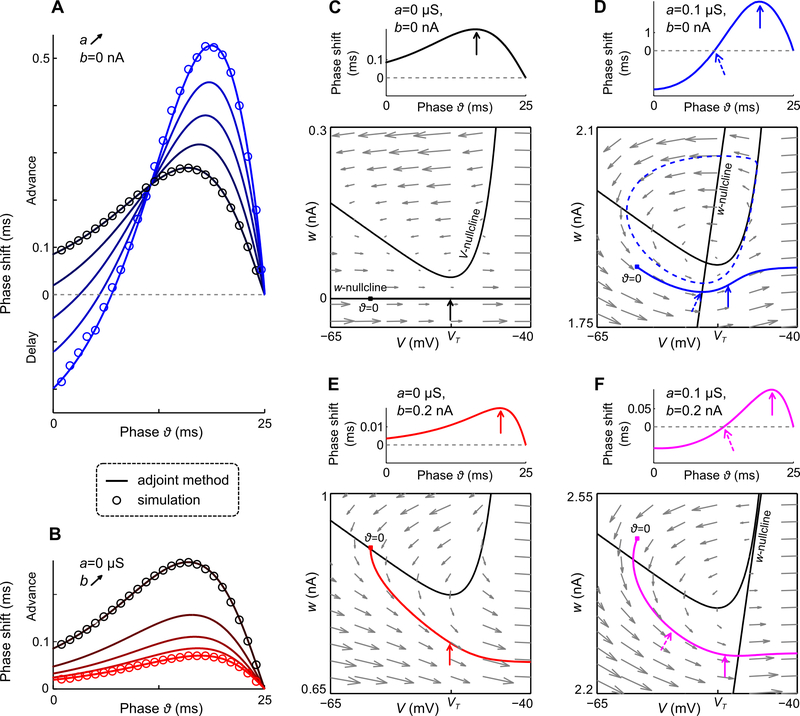 We found that increased adaptation currents promote synchronization of coupled excitatory neurons at lower spike frequencies, as long as the conduction delays between the neurons are negligible. 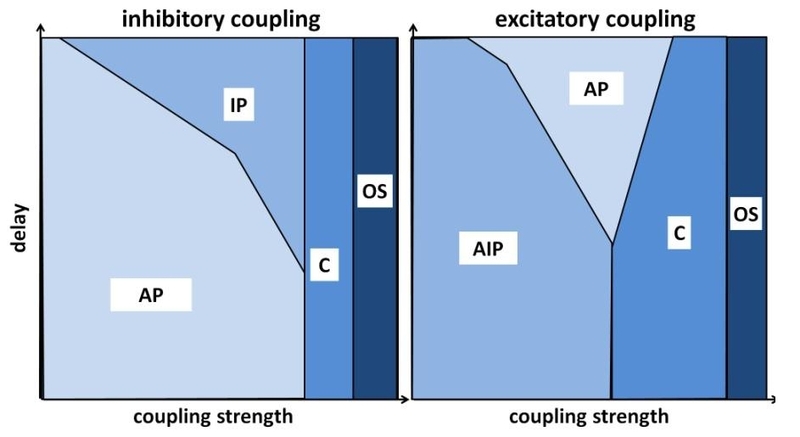 Inhibitory neurons on the other hand synchronize in presence of conduction delays, with or without adaptation currents. 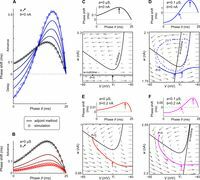 We conclude that in local populations of excitatory neurons adaptation currents provide a mechanism to generate low frequency oscillations that could be controlled through neuromodulation, while faster rhythms seem to be caused by inhibition rather than excitation. The study provides a first step towards understanding potential mechanisms underlying the top-down control of cortical states. 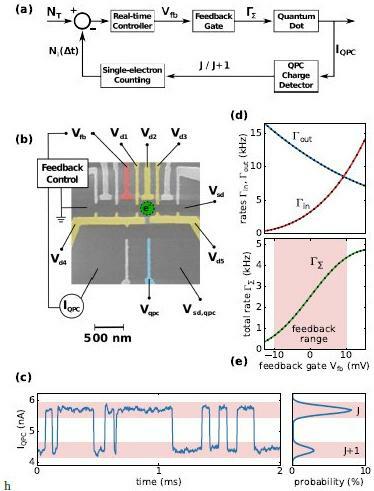 We propose the manipulation of an isolated qubit by a simple instantaneous closed-loop feedback scheme in which a time-dependent electronic detector current is directly back-coupled into qubit parameters. As specific detector model we employ a capacitively coupled single-electron transistor. 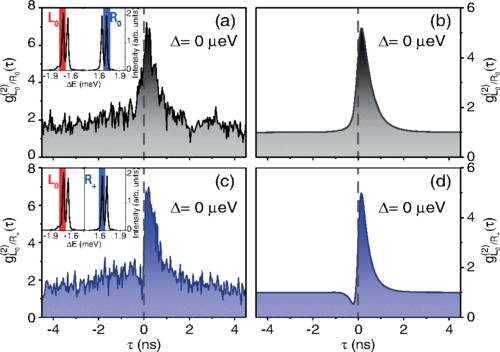 We demonstrate the stabilization of pure delocalized qubit states above a critical detector-qubit coupling. This electronic purification is independent of the initial qubit state and is accomplished after few electron jumps through the detector. 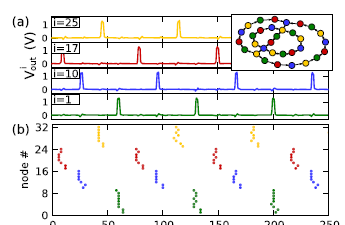 Our simple scheme can be used for the efficient and robust initialization of solid-state qubits in quantum computational algorithms at arbitrary temperatures.